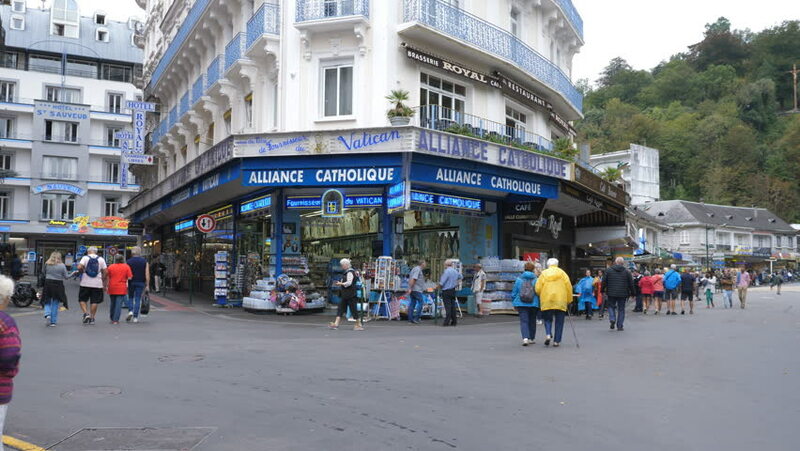 4k00:15LOURDES, FRANCE on September 13th: Alliance Catholic gift shop in Lourdes, France on Sept 13th, 2018. Lourdes, France is a destination for pilgrims, especially those seeking healing. 4k00:57London, England - February 27, 2019: Camden Town - Locals and tourists passing by the famous Camden Market sign and shops on a clear sky day. hd00:14NEW YORK CITY - Circa, December 15, 2013 - An establishing shot of Tom's Restaurant, a location made famous in the American sitcom, Seinfeld. 4k00:16DUBLIN, COUNTY DUBLIN, IRELAND - JUNE 15, 2015: People relax on St. Stephen's Green by the Fusiliers' Arch that was erected to honor Dublin Fusilier who fought in the Second Boer War.